Often times between painting your home or deck, a simple “Maintenance” pressure wash to remove cobwebs, dirt, fungus and mildew etc., will renew that clean look, as well as extend the length of time before needing to repaint. Maintenance pressure washing is a relatively low cost service and the difference in your homes appearance is like night and day! Dirt, moss, fungus and mildew on your concrete patios, walkways and driveways can be unsightly and dangerously slippery. 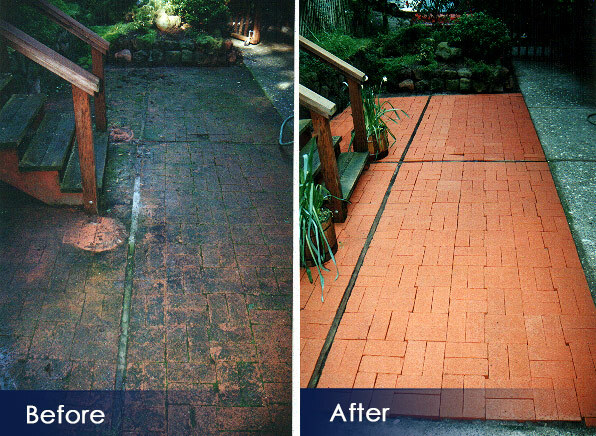 Dirt and moss on your brick and concrete patios, walkways and driveways can be unsightly and dangerously slippery.